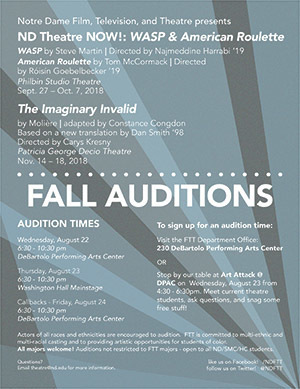 Fall Auditions: ND Theatre NOW! and "The Imaginary Invalid"
Stop by our table at Art Attack @ DPAC on Wednesday, August 22, from 4:30-6:30 p.m. Meet current theatre students, ask questions, and snag some free stuff! Actors of all races and ethnicities are encouraged to audition. FTT is committed to multi-ethnic and multi-racial casting and to providing artistic opportunities for students of color. All majors welcome! Auditions not restricted to FTT majors – open to all ND/SMC/HCC students, faculty, and staff.